Research activities on space radiation and risk countermeasures. The main goal of space research activities carried out by our team is the risk assessment following exposure of astronauts to the radiation environment in space, with an eye towards long-term deep space explorations, together with the development of innovative countermeasures for risk mitigation and health protection. Space missions have always been an inextinguishable source of scientific discoveries, intellectual challenges and technological developments, and both robotic and human explorations have represented the fundamental mean by which many milestones have been reached. However, space missions are far from being risk-free: the way our body works in space is completely different and the environment is way more inhospitable than the one our planet offers, one of the major difference lying in the radiation field astronauts can be exposed to. The primary component of radiation in interplanetary space consists in a quasi-constant background of the so-called galactic cosmic rays (GCR), with, in addition, the occurrence of sporadic so-called solar particle events (SPE). GCR consist of 98% of highly energetic ions, like protons, alphas and HZE particles, while SPE are unpredictable bursts of particles (mainly protons with up to hundreds of MeVs) from the Sun. 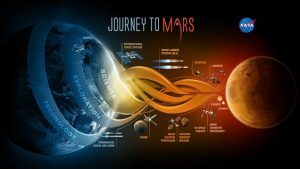 Current plans for human missions contemplate scenarios like lunar/trans-lunar explorations and missions to Mars, which will require longer and longer sojourns of astronauts in space. In this scenario, doses could exceed the maximum limits recommended for safe work conditions, established to avoid immediate effects and to keep at minimum the occurrence of lethal late consequences. Indeed, depending on the dose, dose rate and radiation quality, exposures during space missions may cause both deterministic effects, as e.g. acute radiation sickness (ARS), following a possible SPE event, and late consequences, as e.g. the occurrence of cancer, cardiovascular diseases or damages to the CNS (Central Nervous Systems), whose increased risk can be mainly attributed to protracted exposure to GCRs. Therefore, one of the biggest challenges in this field is the understanding of the potential health hazards and the underlying biological effects induced by space radiation: this is an high-priority issue, which has been addressed by the major space and aeronautics institutions since human space exploration has started, more than 50 years ago. In particular, many experimental works have been performed in order to understand the biological effectiveness of the multiple components of SPE and GCR particle fields, investigating the main mechanism acting at the sub-cellular level and leading to the induction of damages to the cells, and subsequently, hazards to the organism. Lots of efforts have also been devoted to modeling activities, with the development of codes at NASA (e.g. the HZETRN transport code, OLTARIS, etc. ), integrated with physics/transport models, various GCR and SPE options and environmental scenarios (low Earth orbit, deep space, planetary surface…), to support mission planning and vehicle design and to study the effects of space radiation on shielding materials, electronics, and biological systems. Current research carried out in our group aims in particular at refining the strategies to minimize exposure and consequent biological damage to astronauts, by means of the development of innovative passive countermeasures against space radiation. To this aim, we perform Monte Carlo simulations by means of Monte Carlo tools as PHITS or GRAS (Geant4 Radiation Analysis to Space), predicting the dose delivered by the cosmic radiation environment to astronauts, adopting realistic geometries for the space habitats and realistic anthropomorphic phantoms. Space research activities carried out within the group have been funded in the course of the years by the Italian Space Agency (ASI) and the European Space Agency (ESA), main contractors of several projects (see the page “Projects funded by Space Agencies”). The continuous efforts to meet the needs of the strategic research priorities set by Space Agencies has allowed us to carry on innovative research on “hot topics” for the improvement of the design of manned space missions. The development of flight hardware has also led to a strong involvement of national companies , in particular Thales Alenia Space-Italia, and more recently all the industrial partners involved in the PERSEO project. Our group in Pavia is currently coordinating the PERSEO project, funded by ASI. The aim is to design and produce a prototype of a personal radiation protection system, in form of a wearable garment, whose practicality and comfort will be tested on board the ISS. For more info, see the page “PERSEO project”.